Although rocks are all around us, they are often overlooked. Rocks are important to us all: they make up the Earth; they are in a constant state of flux as they move through the rock cycle; they shift across the planet, moving tectonically and changing the relative positions of the seas and the continents; occasionally, they visit us from space, shooting through the atmosphere as meteorites. The petrology displays in the Museum introduce the world of rocks and some of the important concepts that will help you understand this science. Learn more about the specimens in the displays and get to know the large touchable rocks, minerals and fossils which are also on display in the mineralogy and petrology aisle in the main court of the Museum. An easy question you might think, but many people get confused about the difference between rocks and minerals, so we must start with a few definitions. Minerals are naturally occurring inorganic solids with a definite chemical composition and an ordered atomic arrangement. Minerals can be compounds like halite (salt) and quartz, or elements like sulphur and native gold. The study of minerals is called mineralogy. Rocks are made from minerals; they are a mixture of minerals and do not have a fixed composition or an ordered atomic arrangement. There are three types of rocks: sedimentary, igneous and metamorphic, that form in different ways. The study of rocks is called petrology. Meteorites are rocks that have come from space. Most are thought to have been asteroids, or tiny 'planets' that have collided with the Earth, but a few rare meteorites have come from Mars and the Moon. Much of the material that enters the Earth's atmosphere is burnt up and appears in the sky as a meteor or 'shooting star'. Meteorites survive this entry, but often have a thin fusion crust where the outermost part has melted. Meteorites can be divided into groups based on their composition. The main division is into stony, stony-iron and iron meteorites. Stony meteorites are made of silicate minerals, just like rocks on Earth, but usually contain fragments of metal (iron and nickel). When this metal makes up about half of the meteorite it becomes a stony-iron, and when it forms almost all of the meteorite it is an iron. When large meteorites land on Earth they produce impact craters. Different types of rock can be produced within and around these craters, some from the shattering and melting of rock underneath, and some from the molten and solid material that is thrown up into the air by the impact. Shatter cones - when a meteorite hits the Earth, a large shock-wave travels through the underlying rock causing it to crack. The fractures spread out and split into smaller fractures moving away from the point of impact, creating a cone or horse-tail structure that points towards the impact site. Moldavites and other tektites - moldavites are irregular fragments of bottle-green glass found in the Czech Republic and other parts of Europe. Moldavites are all of the same age and were formed by the solidification of blobs of molten rock that were ejected into the atmosphere when a meteorite landed in southern Germany 14 million years ago. Moldavites and other glassy rocks believed to have formed in the same way are collectively known as tektites. Scientists classify rocks according to how they are formed, and recognise three different groups: igneous rocks, like basalt and granite; metamorphic rocks, like marble and gneiss; and sedimentary rocks, like sandstone and shale. Together they form the Earth's building blocks. Igneous rocks form from the solidification of molten rock and are usually associated with volcanism. Basalt is the main rock that forms the ocean floors; it is a dark coloured igneous rock made up of tiny grains of plagioclase, augite and oxide minerals, such as magnetite. It is produced by eruptions from undersea volcanoes located at mid-ocean ridges. In contrast, granite is the main rock that forms the continental crust. Granite is a lighter coloured igneous rock containing relatively large crystals of the minerals plagioclase, quartz and alkali feldspars such as orthoclase. Metamorphic rocks are formed when an existing rock is subjected to heat and pressure; these conditions can change the composition and arrangement of minerals in a rock, and may alter its appearance and texture. Metamorphism of basalt can produce a range of new minerals such as hornblende, epidote and garnet. Folding and stretching during the metamorphism of granite produces intricate textures in the rock gneiss. The physical weathering and erosion of existing rocks will produce sediments, which can be deposited to form sedimentary rocks. They often show layering, and can contain fossils. Sedimentary rocks are classified according to the size and shape of the particles from which they are formed. Sandstone has small regular particles; conglomerate contains a mixture of sizes and can contain large boulders. A rock may also be subject to chemical weathering; when granite weathers the feldspar it contains forms clay. Igneous rocks form from molten rock, or magma. Magma can either solidify below the Earth's surface in a magma chamber, producing intrusive igneous rocks like granite, or it can be erupted from volcanoes as lava forming extrusive igneous rocks like basalt. The type of minerals that form in igneous rocks will depend on various factors including the temperature and the composition of the magma. Granites are 'acidic'; they form from cooler magmas and are rich in feldspars, quartz and mica. Basalt is 'basic'; it forms from hotter magmas and contains plagioclase, augite and oxide minerals. Intrusive igneous rocks may form within a magma chamber as crystals settle, or grow on its walls, floor and roof. These rocks are known as cumulates and often form layers consisting of different minerals such as chromite. Sometimes the layers may be mined, if they are of economic value. Magma contains dissolved water and gases like carbon dioxide; these are termed 'volatiles'. Pegmatites are rocks that form in the late stages of crystallisation of a granitic magma, from a combination of volatiles and elements like beryllium and boron, which are not found in the main granite minerals. They form large crystals of minerals like beryl and tourmaline. Volatiles may also leave the magma and pass through the surrounding rocks to produce hydrothermal ('hot water') veins. Different minerals form at different temperatures in hydrothermal veins. Some hydrothermal minerals like cassiterite form in very hot areas close to the magma chamber, whilst others, sulphur and zeolites, are associated with cooler temperatures close to the Earth's surface. Surface processes like weathering and erosion do not normally form minerals, but redistribute them; however, in some circumstances, minerals can be born from water. Rocks and minerals exposed to Earth's surface are subject to weathering and erosion. They break down into sediments and are transported and deposited to form sedimentary rocks; these are classified by size and type of grain into categories like mudstone, sandstone, and conglomerate. Weathering, erosion and deposition are examples of redistribution, but minerals can also form directly from water. For example, in hot climates shallow seas can completely evaporate, leaving behind salts as mineral deposits. These are known as evaporites. The most common evaporite is halite, also known as rock salt. After a rock or mineral is weathered, it is transported and eventually deposited; the size of the particles that settle will depend on the energy of the environment in which they are deposited. In low-energy environments, like lake beds or deep seas, very fine sediments will settle. In high-energy environments, such as fast-flowing rivers and beaches, only large and heavy grains can settle. Heavy minerals can be concentrated into economically viable deposits by this process of settling, both in the sediments and in the sedimentary rocks formed when they consolidate. Continents and oceans are not fixed in one place but move around the globe through geological time. This display explains the process by which this movement occurs. The outer part of the Earth is called the lithosphere. It is made up of the uppermost part of the mantle plus the oceanic and continental crust. The lithosphere is divided into several 'plates' which move relative to each other. These movements were first recognised in the 1960s; the theory that describes them is known as plate tectonics. Continental crust and oceanic crust differ in structure and composition. Continental crust is relatively thick and is largely composed of granite. Oceanic crust is thinner and is produced at mid ocean ridges. These ridges are described as spreading centres because the plates on either side of the ridge move away from each other as basaltic lava erupts and adds to the crust. Mid ocean ridges - mid ocean ridges are the centres of sea floor spreading. Plumes of hot molten rock come from the upper mantle and erupt from the ridge forming new oceanic crust. Although these ridges are found in all of the world's oceans, the Mid-Atlantic ridge is the most well studied example as it is visible at the surface of the ocean, rising above sea level to form Iceland. Oceanic plates move away from mid-ocean ridges as new material is added to them. This movement is thought to be driven by the action of convection cells in the upper mantle. Older ocean floor, further away from the ridge, has had time to accumulate thick sediments. Eventually all this material is recycled into the mantle at subduction zones. When plates collide with each other, they can produce earthquakes and volcanic activity. The Andes mountains were formed by the subduction of the oceanic Nazca plate beneath the continental crust of the South American plate. Where oceanic crust is subducted beneath more oceanic crust, as in the Western Pacific, a volcanic island arc forms. The collision of two segments of continental crust leads to the development of high mountains, such as the Himalayas and the Alps. Subduction zones - subduction zones are areas of destruction, where the oceanic crust created at mid-ocean ridges is recycled into the mantle. This diagram shows a slab of oceanic lithosphere subducting under a continent. As the slab moves downwards it begins to melt. The molten material travels upwards, through the continental crust, where it is erupted in a chain of volcanoes. Areas of subduction are also associated with mountain building and earthquakes. Most museums have a 'don't touch' policy, but at Oxford we like to see visitors explore specimens up close. This is why the rocks and minerals aisle is now furnished with a series of magnificent touchable specimens, including the oldest rock in Britain, and part of the Nantan meteorite, which fell in China in 1516. Two large mineral specimens are included in the touchables collection. Quartz - while quartz is one of the most common minerals in the Earth's crust, large crystals like these are quite rare. These quartz crystals come from Dodo mine in the Polar Urals, Russia. Quartz, or silicon dioxide, has the formula SiO2, and this specimen has been dated at 1.1 billion years old. Pyrite - this specimen of pyrite comes from a mine in La Libertad province, Peru. Pyrite or iron sulphide (FeS2) is perhaps better known as 'fools gold', and has often been mistaken for gold because of its metallic lustre and yellow colour. There are simple ways of telling the two metals apart: pyrite is harder and less malleable than gold; pyrite crystals commonly form cubes, octahedrons, or pyritohedrons, frequently with striations (parallel lines) on the crystal faces as in the picture; when rubbed pyrite can often give off a sulphurous smell, while gold has no odour. A large ammonite, a fossil stromatolite and a piece of petrified wood are all included in the rocks and minerals aisle. Ammonite - this is the largest ammonite species that ever lived in Britain; called Titanites giganteus, it measured about 40 cm across. This specimen comes from a Jurassic limestone called Portland Stone, found at Admiralty Quarry on the Isle of Portland, Dorset. Ammonites are extinct cephalopod molluscs, related to nautiloids, octopus and squid. This species lived around 140 million years ago. Stromatolites - although the specimen on the left doesn't look like much, it is actually the fossilised remains of one of the earliest life forms in existence, which date from 3.5 billion years ago. Stromatolites are structures built by colonies of cyanobacteria and are common in Precambrian limestones. This example comes from Magondi district in Zimbabwe and is 2.15 billion years old. Stromatolites are still found today. There are petrological specimens in the touchable collection, including a sample of one of the oldest rocks on Earth, a polished slab of granite, and the Nantan meteorite: a rock from space. Greenland gneiss - this paragneiss is one of the oldest rocks on Earth, and formed when a sedimentary rock was metamorphosed at high temperatures and pressures. It is from west Greenland and has been dated at 3.6 billion years old. Orbicular granite - this igneous rock has an unusual orbicular structure that is sometimes seen in granites and diorites. It comes from Mount Magnet in Western Australia and is 2.7 billion years old. The Nantan meteorite - this meteorite comes from either Lihu or Yaozhai town in Nantan County, Guangxi, China, where it fell in 1516. It is an iron meteorite weighing over 155 pounds (71kg), and is composed of the minerals kamacite and taenite, each alloys of the metals iron and nickel. 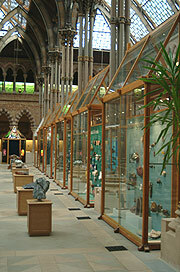 The rocks and minerals displays occupy the aisle south of the central aisle of the main court. The displays on the north side of the aisle explain how minerals and rocks form. They show how the rock cycle works, and explain the powerful forces of plate tectonics. The south side of the rocks and minerals aisle explains how minerals are identified and used. Finding out about minerals introduces the different properties of minerals and how they are used to help with identification. The Industrial minerals and Ore minerals displays show examples of economically important minerals, and all sorts of household items made from them, or metals extracted from them. The final two cases in the aisle introduce the mineral wealth of Great Britain and Northern Ireland. Heritage preserved shows some of the fine and sometimes rare minerals obtained in the past from the now defunct metal mines of the United Kingdom. Quarrying for roadstone and industrial minerals remains a thriving industry, and minerals from working mines and quarries are shown in the Heritage revealed display. Perhaps the most eye-catching display in the Museum is the fluorescent minerals exhibit which is housed in a hexagonal case at the eastern end of the rocks and minerals aisle. Visitors entering the darkened area are enchanted by the glowing specimens before them. Learning more articles are free to all users for educational, non-profit purposes.